We have always loved this image of the Ocean View District, the neighborhood along the San Francisco/Daly City border between Lake Merced and the Outer Mission. The photo has been copied over and over, handed through various collections, including the great San Francisco History Center at the San Francisco Library, and used in displays, calendars, and murals. With the date unknown to many (including us for a long time), 1910 or 1915 was often attached to it, but this image and two others in the set were, in fact, taken one hundred years ago this past week, on October 4, 1918. Decidedly rural—there’s a cow center stage—this callback to the area’s agricultural past is also ironically attractive because the bucolic spot is today a confluence of off ramps, boulevards, elevated BART tracks, and Interstate Highway 280. Some of the cottages are still extant on the hillside in 2018, even if this section of Palmetto Avenue, seen left of the railroad tracks in the photo below, was mostly eradicated by the freeway and BART. The tracks belonged to the Southern Pacific Railroad (SP) and dated back to the creation of the first San Francisco-San Jose Railroad of the 1850s. In 1906, a rival company, the Ocean Shore Railroad, laid a single track that crossed under the SP tracks just east of Crystal Street. 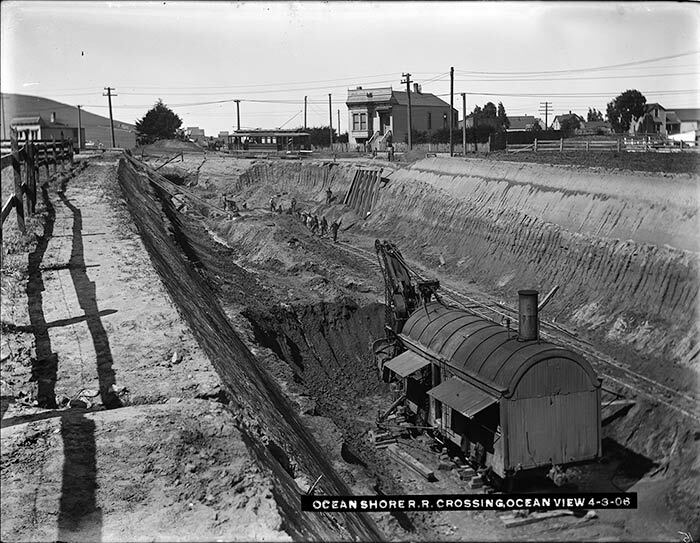 While the Southern Pacific ran along a berm the Ocean Shore tracks lay in a ditch dug below the grade. Just two weeks after this digging photo, on April 18, 1906, the San Francisco earthquake struck and dumped a good deal of the Ocean Shore’s cliff side route into the ocean. The enterprise barely got off the ground in the aftermath and sputtered to its end in 1920.